The 2018 NFL Draft is over, so naturally, it's time for a way-too-early 2019 NFL Mock Draft. While almost all these picks will be wrong, it's a fun exercise at looking ahead to next year's draft. The order is based on the Over/Under win totals for 2018, so yell at Vegas, not me, about the order. Any tiebreakers were broken by the 2018 Draft Order. And yes, there are several teams that have over/unders far too low and will likely be drafting much higher. I'll make not of those as well. This is really a look at what the future needs for teams could be and what prospects could be first round picks. Of course, there will be a ton of changes in both order and who goes where. That's just the nature of the NFL Draft. Unlike last year, the 2018 Draft should have quality QBs and OTs. With that out of the way, let's get to the picks. The Jets need offensive line help and Williams might be the best one in 2019. Already a multi-year starter at Alabama, Williams looks like a true LT. The Colts need an interior pass rusher and Oliver provides that. He's already declared and might be the first player off the board. The Giants have drafted Davis Webb and Kyle Lauletta in back-to-back years. I don't think either is a true franchise QB. The 2019 QB class doesn't look great and I'm taking a big risk with Herbert in the Top 5. He might not even declare and needs to improve, but I like the flashes. 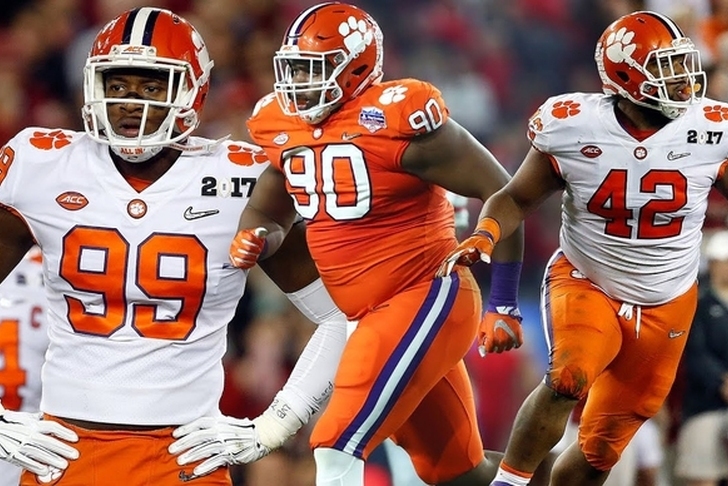 Ferrell would have been a first rounder this year, but returned to Clemson to form a leathal front. The Bucs are in good shape right now for pass rushers, but a young stud would be welcomed. I think the Bears will be better than this, but if not, they'll get an impact player. Little is a potential LT and with Bobby Massie set to be a free agent, he could take over at one starting spot. He does need to improve in a few key areas. If the Broncos are in the top 10 again next year, it's time for a QB. Lock needs to work on his accuracy, but he has some real upside as a gunslinger. We'll see how he fares on a bad Missouri team. The Redskins drafting high might mean it's time for a QB. But, I'll let them roll with Alex Smith for now. Instead, I'll give them A.J. Brown and a potential true #1 WR. Gary needs to produce this year, but the upside is absolutely there. A former top recruit, he can be an NFL stud. I think he might best as a 3-tech, but could play DE if needed as well. As you can tell, this defensive line class is loaded. Simmons might be the player the Cardinals were hoping Robert Nkemdiche would be. Tricky spot for the Bills here, who could go WR as well. But if they struggle, looking for another OT might be the way to go with Jordan Mills set to hit free agency. Edwards could be a great one. If Richard Sherman doesn't work out, CB is a big need for the 49ers. Greedy Williams might be the best one this year. The Raiders ignored the LB spot in the draft, but can correct that in 2019. Devin White is a very talented player and might be the next great LSU LB. He could go Top 10 as well. The Bengals still need OL help. If Jake Fisher and/or Cedric Ogbuehi can't man the RT spot, they have to find someone else. Adams could be that guy. This might be too low for Dexter Lawrence. He's a monster in the middle and a great fit for the Titans. By the way, the Titans and Texans will finish above their places. The Texans still need offensive line help. Hyatt could be a first round pick. Patterson is eligible this year and that's huge for his draft stock. He could go before this if he shows the ability that made him a coveted recruit. Jim Harbaugh should be great for his development, but he needs to improve his consistency. The Lions need more pass rush, especially if they let Ziggy Ansah leave. Jackson is one of several great Miami Hurricanes defenders. This seems WAY too low for the Jags. But if they miss the playoffs, I'll blame the QB. Stidham has upside, but he has to be better in key games. He'll be asked to do more this year and if he thrives, he could be in the mix for the Heisman and #1 overall pick. The Ravens need a LB to pair with CJ Mosely on the inside (who will hit free agency soon) and Edwards has looked great at Wisconsin. Davis would fill a big need for the Cowboys: DT. They need a one-tech type and I think Davis can fill that role. Plus, David Irving might not be back. This might be a steal for the Cowboys. The Chiefs really need another CB with Marcus Peters gone. Jackson has shown some great ability. Allen had some buzz this year, but returned to school. He's a bit small for the Panthers' scheme, but can rush the passer or even play some off-ball LB. The Falcons really don't have many needs right now. Another good DT to pair (or even replace down the road) with Grady Jarrett as a disruptor would be perfect. The value could be great here. Hey, maybe Seattle will FINALLY get some offensive line help. He's not that Michael Jordan or that other Michael Jordan, but he's a damn good OG. The Rams have drafted two OL this year, but Ivey can play tackle or guard in the NFL. More offensive linemen are needed for the Rams and Ivey might be best at OG. Johnson has great size and has elite upside. He could be in for a big year at Texas and could be a first round pick. If the Vikings lose Sheldon Richardson, Wilkins is a great replacement. Again, it's a loaded DL class. I think he'd be a nice fit as a DE in the Packers' scheme. With Mo Wilkerson on a one-year deal, the Packers might need another one. Smith fills a big need for the Steelers. He's a key part of the USC defense. Also, keep an eye on the likes of Anfreenee Jennings, Shaq Quarterman, Devin Bush. Someone will end up picking a RB early, but the Eagles make sense. Jay Ajayi will be a free agent and it's a need. Love returned to college and if he shows he can catch, this will be far too low for him. There are quite a few QBs that could go in Round 1, even though it's not a good draft class. Some other names to watch beyond Thorson are Ryan Finley of NC State, Will Grier of WVU and even Jake Bentley from South Carolina. I don't think it's a great QB class overall. Of course, we'll see how they all fare this year.